Active sites, atom and residues labels. Various coloring schemes and tools. This makes it a perfect tool for data sharing and publishing. You don't need to install IcmJS to view pages. 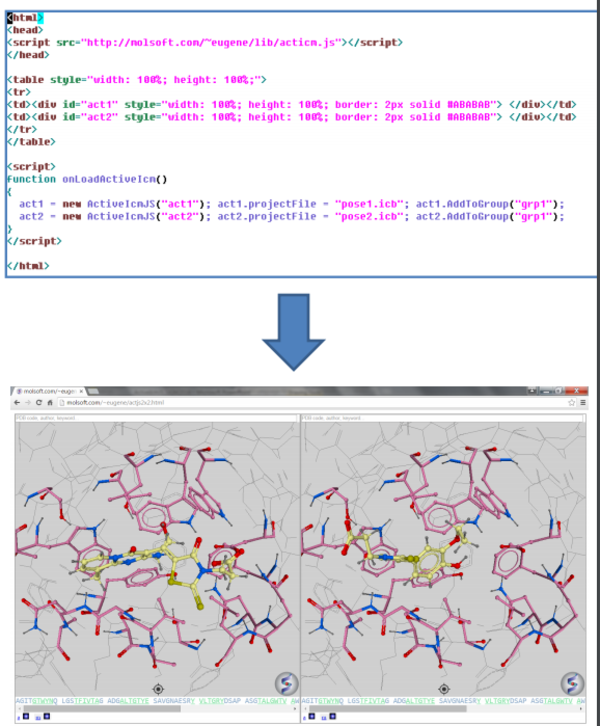 To make a fully interactive 3D molecular web page from ICM. Use ICM vesion 3.8-5 or higher. If you do not have access to this please email us to request it. Make a set of slides. Go to File/Export as ActiveICM Html and then select the IcmJS check box. IcmJS is free to use so long as certain conditions are met. Please review the license agreement carefully here (PDF). Please Contact us if you have any questions or would like to obtain a IcmJS server license. IcmJS is fast (runs at near native speed), has exceptional high quality graphics and it ports the ICM shell and therefore has full access to ICM scripting functionality. This makes the viewer capable of performing to a wide range of computational biology and chemistry functions available in ICM. For example, you can run any local or remote ICM script or any list of commands from the web browser (see the technical documentation). Abagyan, R. et al. Disseminating structural genomics data to the public: from a data dump to an animated story. Trends Biochem. Sci. 31, 76:78 (2006). Lee, W. H., Atienza-Herrero, J., Abagyan, R. & Marsden, B. D. SGC--structural biology and human health: a new approach to publishing structural biology results. PloS One 4, e7675 (2009). Lee, W. H. et al. 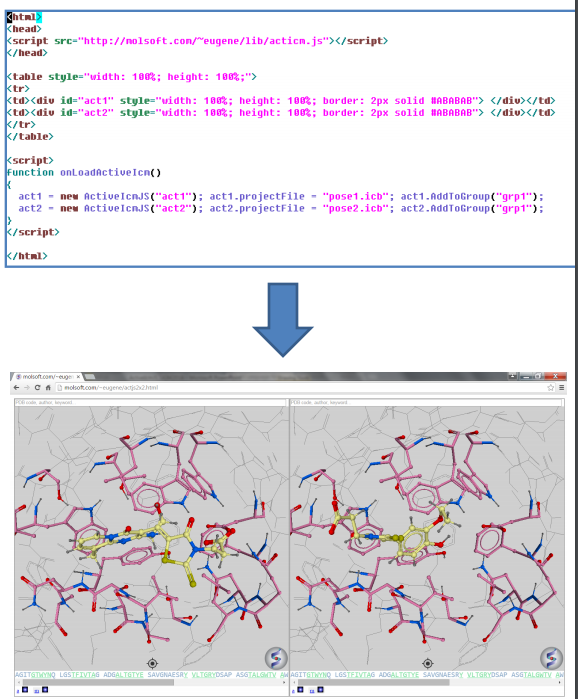 Interactive JIMD articles using the iSee concept: turning a new page on structural biology data. J. Inherit. Metab. Dis. 34, 565:567 (2011). Raush, E., Totrov, M., Marsden, B. D. & Abagyan, R. A new method for publishing three-dimensional content. PloS One 4, e7394 (2009). Why did MolSoft change from ActiveICM plugin to IcmJS? Originally when ActiveICM was developed all browsers supported the Netscape Plugin Application Programming Interface (NPAPI) but over time browsers have dropped their support for this. So we developed IcmJS which is a better alternative. How to convert page with ActiveIcm to IcmJS? If your page was created in ICM using "File/Export to HTML" menu, then the simplest way is to re-export it using the latest ICM and checking 'Export Graphics in_ActiveIcmJS' checkbox. The newly created page will contain ActiveIcmJS object and will not require any additional plugins. For manually created pages please visit our technical page. What does the embedded ICM code look like? Is the ICM shell and Scripting Language Fully Accessible from the Web Browser? Yes you can run any local or remote ICM script or any list of commands from the web browser (see the technical documentation). Does IcmJS support Multiple Windows? What is the technology behind IcmJS? IcmJS is written in ASM.JS which is an optimizable, strictly typed, low level subset of JS. The full ICM shell and graphics have been compiled into JS using Emscripten. MolSoft has developed a special layer which translates OpenGL into WebGl calls which allows the same codebase and delivers high quality graphics.